Poles and Polish Americans made great contributions to the Union cause during the Civil War. Of the scores of Poles that served in the American infantry, one would end up playing an outsized role in history, George Brinski, the Pole future president Grover Cleveland hired as his substitute. In early 1863, Grover Cleveland was a well-established personality in Western New York. He was young, had his own law firm, and was beginning his political career with an appointment as Assistant District Attorney of Erie County. But that all came under threat in July, when Cleveland‘s name was pulled for the Union draft. Not wanting to derail his career, and possibly be killed, Grover began looking to hire someone to take his place, a practice allowed by the army at that time. Cleveland enlisted his friends in his search and one of them Capitan Reinhardt, knew the perfect man. George Brinski (alternatively spelled Beniski, Benninsky, and Brinske) was born in Poland in 1832. A sailor since his youth, George arrived in America in 1851. The stocky, five foot three Brinski worked a number of shipping lines in the Atlantic until 1860 when he made the move to the Great Lake routes. By the middle of the Civil War, George was working the ship Acme running corn, flower, lard, beef, and other commodities from Chicago to Buffalo. Of all the different ports Brinski stopped at, Buffalo was his informal home and where he had the most friends. An acquaintance of Brinski, Reinhardt thought him to be the ideal man for Cleveland. The salty sailor had everything you wanted in a gun for hire, little to no family, a base knowledge of the English language, and a bad case of war fever. Knowing he could make $300, Brinski agreed to meet with Grover on August 5th. At the meeting the two struck a deal, George would be paid $150 with another $150 if he survived the war. Reinhardt took George to Squire Ryan to get the legal paperwork done and George was sworn in. That evening George slept soundly in a cot at Fort Porter, with $150 more to his name. Now a member of Company F of the 76th New York Infantry, things moved quickly for George. First he was on a train to Elmira and then off to Riker’s Island for training. 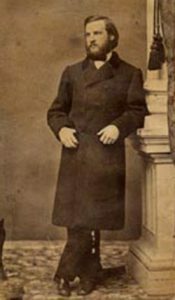 Within a week Brinski was in Rappahannock, VA where before he could see any action was injured while working on a supply wagon. After a long recovery time, George was reassigned as a handyman serving different hospital units under surgeon John Billings. On August 11, 1865, just two months after Brigadier General Stand Watie surrendered the Confederate Army of the Trans-Mississippi, Brinski was mustered out of the army. After the war, Brinski settled in Detroit returned to working on the lakes followed by a stint with the railroads. After a few years the grueling manual labor began to agitate his war injury and George had to quit. With no work, no money, no family, and only finding refuge in poorhouses, George appealed to the man whose life he effectively saved, Grover Cleveland. But when the two met in Buffalo in 1885 Cleveland brushed him off and refused to help. The tragic life of Brinski was used against Grover during his political career, giving ample ammunition to the veterans groups Cleveland regularly alienated. Eventually the government declared George an invalid and by the spring of 1887 he was living at the New York State Soldiers’ and Sailors’ Home in Bath. As he lay dying, George sent letters and gave interviews to any reporter who would listen about how being Grover Cleveland’s substitute ruined his life and scores listened. On August 18, 1887 George Brinski’s death made headlines across the country but instead of an extravagant burial in Arlington National Cemetery, Brinski was laid to rest in a simple grave in rural Steuben County. "Answers to Questions." Long Island Daily Press [Jamaica, NY] 12 Oct. 1940: n. pag. Print. Beniski, George - Organization Index to Pension Files of Veterans Who Served Between 1861 and 1900. 5 Feb. 1886. Fold3.com, n.p. Bielski, Mark F. Sons of the White Eagle in the American Civil War: Divided Poles in a Divided Nation. Philadelphia: Casemate, 2016. Print. Bucki, Carl L. "Polish Immigrant Served and Suffered for Grover Cleveland." The Am-Pol Eagle. Web. 26 Jan. 2017. "Cleveland's Ingratitude." The Tri-States Union [Port Jervis, NY] 18 Oct. 1888: 7. Print. "Cleveland's Phenomenal "Luck."" Columbia Republican [Hudson, NY] 1 Sept. 1887: n. pag. Print. "Cleveland's Substitute." Buffalo Evening News [Buffalo, NY] 11 May 1885: 1. Print. "Cleveland's Substitute." Corning Journal [Corning, NY] 6 Sept. 1888: n. pag. Print. "Cleveland's Substitute." The Glenn Falls Times [Glenn Falls, NY] 12 July 1887: 2. Print. "Cleveland's Substitute." Troy Daily Times [Troy, NY] 6 July 1887: n. pag. Print. "Editorial Notes." Addison Advertiser [Addison, NY] 30 June 1892: n. pag. Print. "General News Items." The Western New Yorker [Warsaw, NY] 15 Jan. 1885: n. pag. Print. "George Brinski, President..." Buffalo Evening News [Buffalo, NY] 20 Aug. 1887: n. pag. Print. "George Brinski, the Man Who..." Havana Journal [Havana, NY] 27 Aug. 1887: n. pag. Print. "Grover Cleveland's War Record." Medina Register [Medina, NY] 8 Jan. 1885: n. pag. Print. "His Substitute." The Evening Journal [Jamestown, NY] 11 July 1887: n. pag. Print. Lachman, Charles. Secret Life: The Lies and Scandals of President Grover Cleveland. New York, NY: Skyhorse, 2013. Print. "The Bath Courier Says One Of..." Corning Journal [Corning, NY] 12 May 1887: n. pag. Print. "The Buffalo News Published a Column Interview with George Brinski..." The Geneva Gazette[Geneva, NY] 15 July 1887: n. pag. Print. "The Editor of the Courier Recalls..." The Press [New York, NY] 5 Sept. 1888: 2. Print. “The Man of Destiny." Albany Morning Express [Albany, NY] 22 Aug. 1887: n. pag. Print. "The Philadelphia Press of Sunday..." Columbia Republican [Hudson, NY] 4 Aug. 1887: 1. Print. "The Soldier's Home at Bath." The Cuba Patriot [Cuba, NY] 19 May 1887: 1. Print. Walter, Francis Joseph. Grover Cleveland and Buffalo. Buffalo: Buffalo and Erie County Historical Society, 1963. Print. Witul, Gregory L. "Grover Cleveland Used Pol-Am to Avoid Military Service." Am-Pol Eagle [Cheektowaga, NY] 9 Nov. 2016: 9. Print.